What is greatest Japanese swords brand HIGOTORA? What is HIGOTORA Brand Japanese Shinken sword? For exsample, intangible a cultural heritage class crafts-men about making Saya, intangible cultural heritage class crafts-men about painting Japanese lacquer on the Saya, intangible cultural heritage class crafts-men about making Tsuba, a intangible cultural heritage class crafts-men about making gold inlay and a intangible cultural heritage class crafts-men about making Tsuka(handle). Especialy, the price of Saya painted by "Hon-Urushi"that is genuine Japanese lacquer is at least US$50,000.00. One more greatest point is that we will able to order for most famous Swords-smith who is "Gassan" and "Akamatsu-tarou_Kanetsugu" to make the blade of Japanese Shinken sword. Gassan Sadayoshi was born in 1780 in Dewa province and he was a descendant of the Gassan school of Koto times. When he was born, however, the school had nearly gone as it had been fading out of existence since the beginning of the Edo period. He went to Edo to study under Suishinshi Masahide who was working hard to restore the koto traditions. Upon the passing of Masahide, Sadayoshi moved to Osaka. This was around 1825. After moving to Osaka, he re-established the Gassan school of the Koto period and his students and descendants have re-energized this school so that it still exists today under the modern smith, Gassan Sadatoshi. Sadayoshi was able to re-create the famous Gassan ayasugi hada and he made it the foundation of the newly re-energized Dewa Gassan school that was located in Osaka. He was also adept at creating the masame-hada of the Yamato school and dense mokume-hada. His styles of hamon include chu-suguha in nie deki, small patterned choji midare, koshi-no-hirata midare, and others. 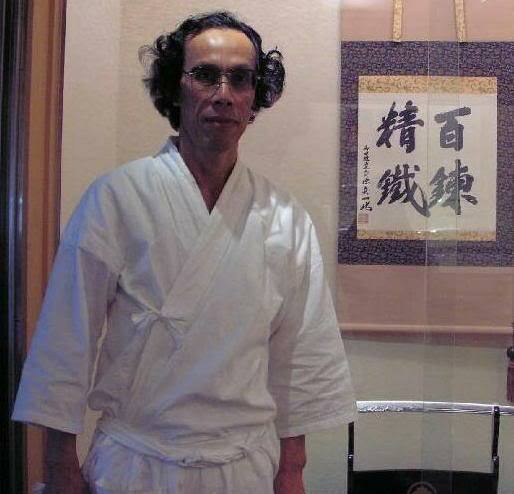 Gassan Sadayoshi became a master in Yamashiro and Bizen styles as well as the Gassan style. His son and grandson added a mastery of Soshu den and Yamato den, thus becoming fluent in all the top styles of sword crafting. Toward the end of his life, Sadakazu would make daimei for Sadayoshi and this is something that continued when Sadakazu himself became elderly and his son, Sadakatsu, took over the main roles in the workshop. 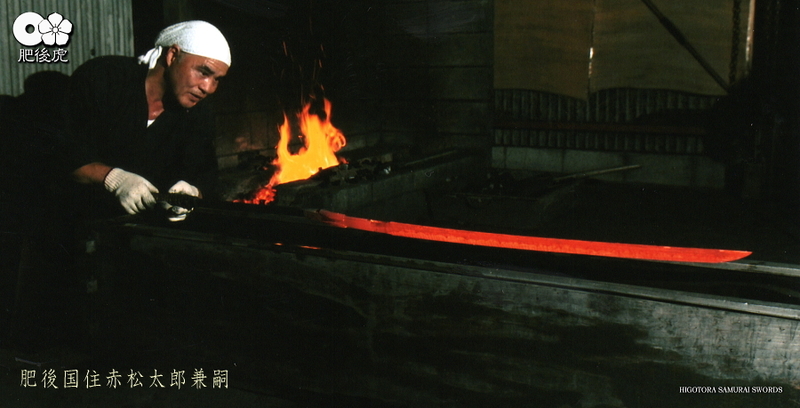 In other words, Sadakazu and Sadakazu produced swords by themselves but signed the blades with his father's name. Sadayoshi trained many well-known pupils in addition to his adopted son, Sadakazu. Some of the most famous were Kusano Yoshiaki, Sugimoto Sadahide, and Horii Taneyoshi. There are references attesting to Sadayoshi having trained pupils to be proficient enough to leave the master's workshop and be on their own by the time Sadakazu was adopted in 1843. This is evident from the pledges written by Sadayoshi's two senior pupils as they were gaining independence in 1843 and 1867 stating that they would never disclose the secrets they had learned from their master. Sadayoshi died at the age of 71 (70 accordingly to the occidental was of counting age) in the third year of Meiji (1870). Picture of Swords-smith "Gassan Sadakazu"
Present swords-smith of Swords-smith "Gassan" family is "Gassan Sadatoshi"
Picture of Swords-smith"Gassan Sadatoshi"as present swords-smith of Gassan family. Movie of forging the blade of Japanese Shinken sword by Swords-smith"Gassan Sadatoshi"
The price of apanese Shinken sword made by Swords-smith"Gassan Sadatoshi" is at least US$45,000.00. We have one more swords-smith og HIGOTORA Brand. He is intangible cultural heritage class Swords-smith in KyuSyu in Japan. Swords-smith "Akamatsu" family have with a long history from Meiji period. Swords-smith"Akamatsu-tarou_Kanetsugu" had been designated as intangible cultural heritage formally. His pictuers is like as follows. "Akamatsu-Tarou_Kanetsugu"is real name of "Kimura Kanesada"
"Kimura Kanesada"is Swords-smith-name of Swords-smith"Akamatsu-Tarou_Kanetsugu"
For exsample, Swords-smith-name of Swords-smith"Mitsutoshi Ogawa" is"Noshu Bugei Haciman Kanekuni"
Swords-smith-name is like stage-name for actor. The price of apanese Shinken sword made by Swords-smith"Akamatsu-tarou_Kanetsugu"